Deep in the quiet, beautiful hills of New Hampshire – just outside of Hanover and Dartmouth College – is a world-class athlete training to swim harder, bike faster and run quicker than her fellow triathletes. Sarah True’s hard-working attitude perfectly suits her quiet northeastern town. Sarah True has been dominating the ITU triathlon scene since 2005 and has competed in the London and Rio Games. Balancing three sports – swimming, cycling, and running – doesn’t come easy, but Sarah somehow manages it all with considerable grace. When you meet Sarah for the first time, you quickly realize that Otzi is the center of her life. He’s her FUN between training sessions, her reason for an occasional stroll, and in many ways represents Sarah much like her own child – playful, courageous, and committed – the perfect fit to represent Nulo and what great fuel can do for your pets. 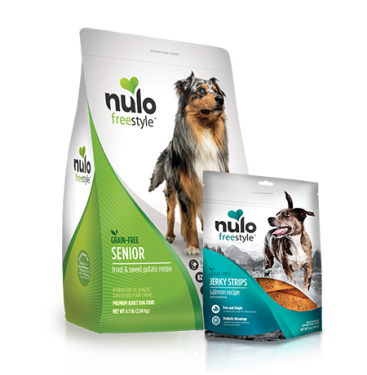 Nulo recipes can help alleviate pain from aging joints and hips.